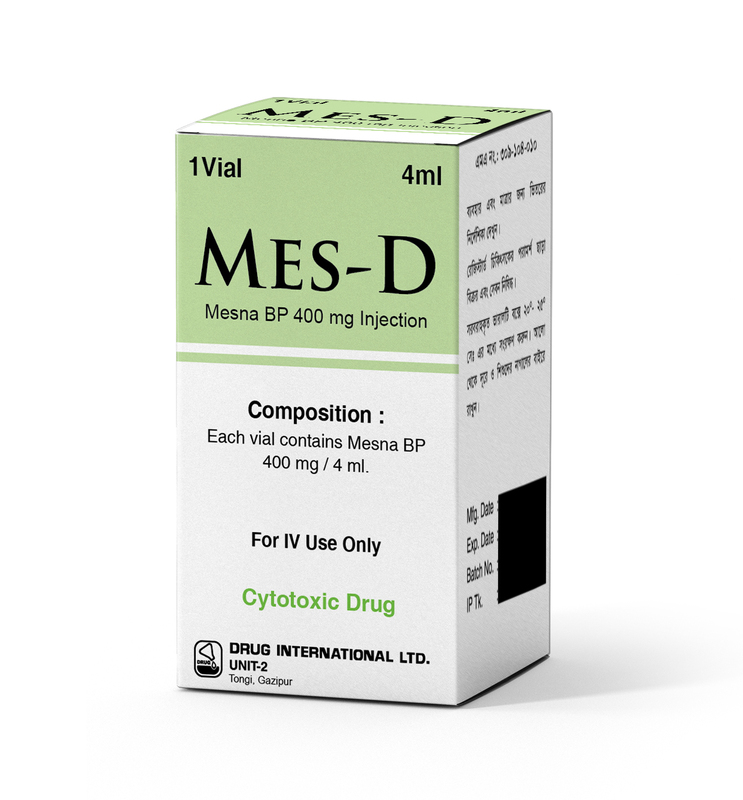 Composition:Mes-D : Each Vial contains mesna BP 400 mg/4ml(IV Injection). Indications: It is indicated as a prophylactic agent in preventing ifosfamide-induced hemorrhagic cystitis (syndrome of bleeding and irritation of the bladder). It is also indicated in preventing high dose cyclophospamide-induced hemorrhagic cystitis. Intravenous Dosing:Mesna Injection is given as intravenous bolus injections in a dosage equal to 20% of the Ifosfamide dosage (w/w) at the time of Ifosfamide administration. See leaflet inside for more information. Use in pregnancy and lactation: Pregancy Category B. There are no adequate and well-controlled studies in pregnant women. Nursing Mother-It is not known whether this drug is excreted in human milk. Because many drugs are excreted in human milk and because of the potential for serious adverse reactions in nursing infants from Mesna, a decision should be made whether to discontinue nursing or to discontinue the drug, taking into account the importance of the drug to the mother.